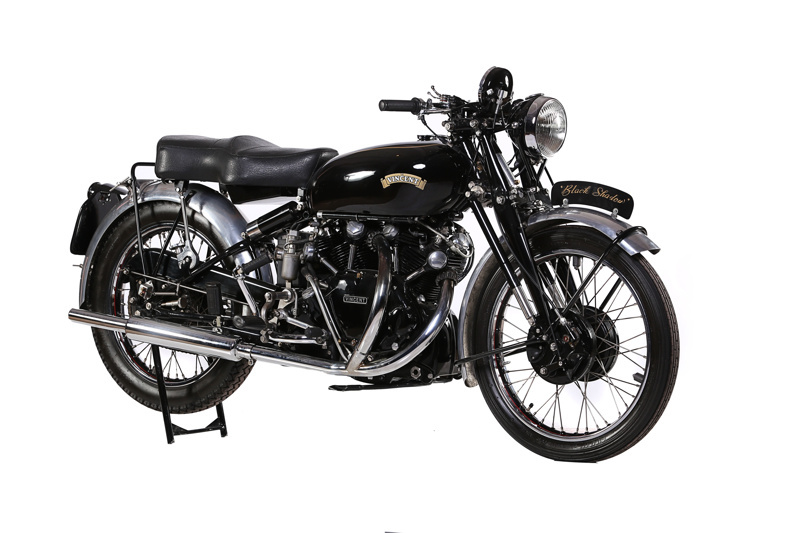 This Vincent Black Shadow has been constructed entirely from newly manufactured parts supplied by the Vincent Owners Spares Company in the UK which, over the years, has collected around 1,100 drawings for post-war Vincent components. Around 2004, it became apparent that it would be possible to manufacture a complete engine from the VOC Spares Company’s component stock and one was built in 2005. It was then decided to produce a frame and front fork, the main components of which had been unavailable new for 50 years, to prove that any parts needed for a post-war Vincent could be supplied. The model chosen was the Black Shadow in as near as possible to 1950 Series-C specification. The VOC Machine Registrar issued frame and engine numbers which fit in with the original series used by the Vincent factory yet clearly identify it as being of new manufacture. Because some manufacturers of propriety items such as Amal, Lucas and Miller no longer exist, a few compromises had to be made. The carburettors are new Amal type 6 (Rapide size) instead of Type 29s, a modern BTH magneto is concealed under the magneto cowl, an Alton 12-volt alternator is fitted where a Miller dynamo would be and a 12-volt battery is concealed within a replica Exide battery case. Also, for improved durability, all small fittings are stainless steel, lightly bead-blasted to resemble the original cadmium finish. The motorcycle was completed at the start of 2007 and officially handed over to its owners, the Vincent Owners Club who registered it for UK road use as a 2007 machine. Some miles of running in were carried out to bed-in the engine and cycle parts and make the necessary fine adjustments to ensure that it rides well as can be achieved. Following a number of road tests, it was featured in several publications: Classic Bike Guide, Real Classics, The Institute of Mechanical Engineers Journal and Motor Cycle News. It was shown at a number of events and rallies during 2007, although most people thought that it was just another concourse example of a 1950s Stevenage-built Vincent! It was acquired for the Nelson-based NZ Classic Motorcycles collection at an auction in Staffordshire in April, 2008. It was acquired by Transport World for the Classic Motorcycle Mecca collection in May, 2016.